Flax is believed to be native to Egypt, but its origins are questionable since it has been used widely around the world. 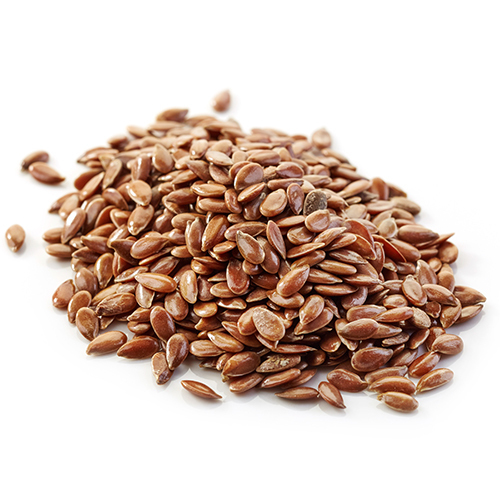 Flaxseed (also called linseed) are small, brown, tan or golden-colored seeds that are the richest sources of the plant which belongs to the linaceae plant family. The flax plant is a small, single-stemmed and has grayish green leaves and sky-blue flowers. Only the seeds (flaxseed) and oil of the flax plant (flaxseed oil) are used medicinally. Linseed oil is the term usually used for the oil found in polishes, varnishes, and paints. Flaxseed products are commercially available as whole or ground seeds, gelatin capsules, and oil. Some herbalists recommend adding the ground or whole seeds to you everyday diet to get the maximum benefit from the herb. Flax seeds have been consumed as food for over 5,000 years and may have very well been the world’s first cultivated superfood! Add an omega-3 boost to a variety of dishes with this surprisingly versatile ingredient. Ground flaxseeds mix with several foods unnoticed. Use 1 or 2 tablespoons in oatmeal, yogurt, a smoothie, cold cereal, sprinkled over a sandwich or mixed in a salad. Ground flaxseeds mix with batters and dough and hardly influence the consistency. Several cracker, cookie and muffin recipes use flaxseeds as their main flavor if you wish to base a dish around it. Vegan bakers often substitute a flaxseed mixture for eggs in baking recipes like pancakes, muffins, and cookies. These baked goods are slightly gummier and chewier than those that use eggs, and the volume is decreased. It can also be added to crusts for meats or your favorite baking recipes. Flax tolerates a range of soils and climates and can be grown in almost any part of the United States. Flax grows best in cool weather, so sow it outdoors as soon as you can work the soil in spring. This can be as early as January or as late as May, depending on where you live. To reap both seeds and fiber, harvest the flax about four months after planting. The leaves on the lower half or two-thirds of the stem will be turning yellow and dropping off.